“House Calls” and “Visiting Doctors” at your service in Atlanta Georgia. Nice. Atlanta based, Resurgia Health Solutions is an innovative “house calls” medical practice focused on providing medical care when and where patients need it. Our visiting house call physicians are able to provide medical care at home, treating patients in the comfort of their own homes with a suite of mobile medical services that align closely to the services provided in a typical doctor’s office, yet with more hands-on and in-depth approach to treating patients that is very differentiated from the traditional doctor’s office visit – our typical visits are 30 to 90 minutes long. The premier provider of “House Call Doctors in Atlanta Georgia”. Resurgia’s visiting doctors deliver a high-touch approach to mobile medicine (not TeleMedicine) that is refreshingly innovative and highly effective in getting to better patient outcomes and lower overall health care costs. Call 1-84House-Doc or email info@resurgia.com to learn more about Resurgia House Calls Medical Practice and schedule an appointment with our visiting physicians. Our skillful, board certified providers physicians lead carefully selected teams of providers that spend quality time with patients and work with a larger healthcare ecosystem to enable more complete care. We actively curate a network of high-performing home care agencies, senior care facilities, medical equipment providers, specialist medical providers, transitional care and rehab providers, community resources and hospitals that support our goals and partner with us in providing more complete care. Call us to learn more about Resurgia’s House Calls Medical Practice and how our visiting physicians can help you complete the circle of care, create better outcomes and reduce the overall cost of care. This belief is central to everything that we do. Our compassionate, highly-skilled clinicians, contractors and support teams are laser focused on providing high-quality medical care – from routine exams to treating complex conditions – in the comfort of your own home. Our goal is to support and enable our patients’ health care goals, and by extension, their life goals. We do this by providing quality medical care at home, with the intent of helping our patients live fuller, longer, more independent lives, with fewer hospital admissions. The Resurgia Model of Care is designed to minimize time spent in the hospital, reduce the overall cost of care and improve the quality of life for our patients and their care givers by enabling better patient outcomes. Our compassionate, skillful clinicians help our patients get better faster, and stay healthy longer. 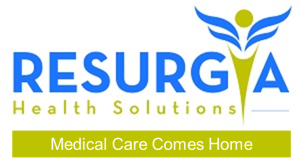 Call 1-84House-Doc or email info@resurgia.com to learn more about Resurgia House Calls Medical Practice and how our visiting physicians can provide you with quality medical care at home. Our mobile infrastructure is able to support house calls and provide patients with complete medical treatment, labs and testing, prescriptions, medication delivery, imaging, referrals…and much more, all in the comfort of their own homes. In addition, we actively curate a network of high-performing home and personal care agencies, senior care facilities, medical equipment providers, specialist medical providers, transitional care facilities, rehabilitation facilities, community resources and hospitals that support our goals and partner with us in providing more complete medical care at home…when and where you need it. In addition to providing care where patients need it, Resurgia strives to ensure low wait times for appointments and accepts most major health plans. Simplicity in medicine. To get started, simply call 1-84House-Doc or (404) 445-5304, or drop us an email at info@resurgia.com to get registered, or to learn more about Resurgia House Calls Medical Practice. Enjoy the Quality, Convenience and Affordability of Medical Care that Comes Home. No Compromises.